By Xah Lee. Date: 2016-08-07 . Last updated: 2017-06-25 . 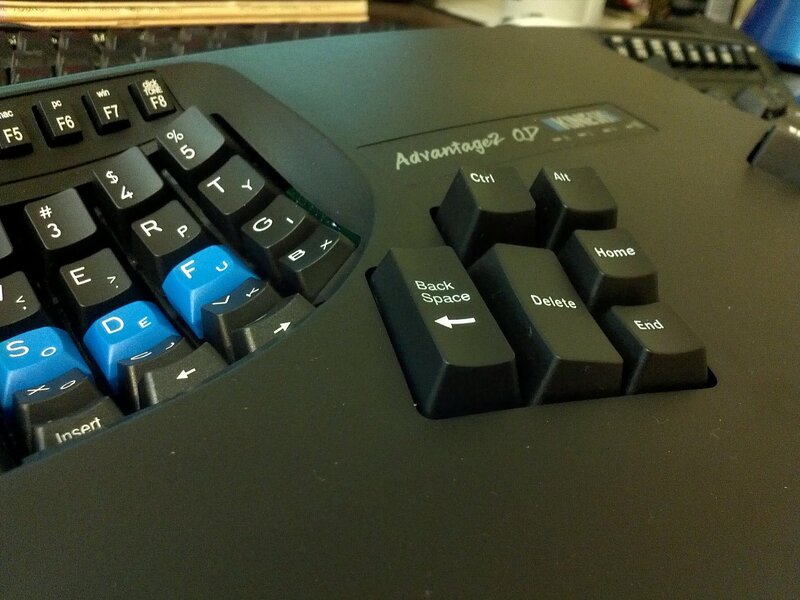 This page shows a collection of layout ideas for Kinesis and ergodox keyboards. Kinesis left thumb keys cluster. First of all, it's important to know which keys are easier to press. Because you need to map the most used modifier key to the most easy-to-press physical keys. The ordering depends on your hand size. i'm average sized Asian male. The ⌫ Backspace is where my thumb rests on. This is the most easy key to hit. Next easy key is the ⌦ Delete. Next is Ctrl. To hit Ctrl, i kinda move my whole hand up a bit. Next, is End. I stretch my thumb to press it. Next, that Home position is next easy key. The most hard-to-reach position is the Alt. I need to stretch and move my palm about 2 cm to reach it. now, let's talk about key mapping. here's the complete layout, for reference. for normal computer users, the ⌫ Backspace is most often used. Nice placement. but Ctrl requires some reach. Also, Alt is difficult to reach. One problem is that Alt+Tab is very frequently used, but is very akward on the default layout. You have to expand your whole hand to press that key combination. the other problem is that, Ctrl+⌫ Backspace is hard to do with just left hand, and Ctrl+← and Ctrl+→ are also hard to do with just left hand. You can't press Ctrl+⌫ Backspace easily with just left hand because they are in the same cluster and the two keys are not adjacent. For example, suppose you want to hold Ctrl and press ⌫ Backspace multiple times. This key combo is also very frequently used. So, to do this combo easily, you have to use the right hand side's Ctrl. The above summarize the major problems of the default layout. To recapitulate, the main problem is Ctrl+⌫ Backspace and Alt+Tab. In addition, if you frequently need to press Ctrl or Alt, such as with emacs or photoshop, then, it's a problem, because the Alt is hard to reach. Also, having 2 Ctrl seems a waste, because with thumb keys, it should be possible to live with just one Ctrl comfortably. the above is my issue with the default thumb cluster layout. now, let me sketch what alternatives might be, and how it might solve the problem. move the Ctrl and Alt to the 2 big keys. The idea of this layout is that Ctrl and Alt are on 2 big thumb keys. This layout is good if you have biggish hands and pressing the 2 big thumb keys does not require any stretch. Ctrl+⌫ Backspace is reasonably easy. Ctrl+← and Ctrl+→ are reasonably easy. Alt with other keys are reasonably easy. ❖ Window with other keys are reasonably easy, Such as ❖ Window+↑ and ❖ Window+↓ used in Microsoft Windows to maximize window and minimize window. Here's a collection of layouts, usable for Kinesis keyboard and ergodox keyboard. I noticed that the keys below K and M are actually very easy keys that can be pressed by thumb (for small hands). So, i made this layout. Ctrl, Alt on the thumb. ⌫ Backspace is now at a easy spot. And together with ⌦ Delete as a pair in intuitive position as physically adjacent left/right pairs. The up/down arrows ↑ ↓ pair are in intuitive position as physically adjacent top/bottom pairs. The Tab key is now at a good position. This key needs to be pressed repeatedly for programing. If you have small hands, you'll find that thumb keys are placed too far and too high. Pressing them frequently will cause problems. I have average sized Asian hands. I wasn't comfortable kept holding the thumb keys as Ctrl or Alt. It means my thumb will be constantly in stretched position. So, rethink, now the thumb cluster keys are considered as hunt-n-peck keys, instead of touch-type keys for thumb. To press Control or Alt, move hand, don't just move thumb. close to default. This has advantage of matching key labels. Important when you have many computers and many keyboards and you remap a lot. You don't have to ask “what did i do to this keyboard” after a month. Consider most of the thumb keys as pecking keys, not touch-type keys for thumb. So, to press Ctrl or Alt, I now move whole hand and use index finger. Slower, but healthier. Ctrl and Alt in traditional PC keyboard positions. Arrow keys togeher, in a more intuitive cluster.